Moody Gallery will present an exhibition of recent collages by Mary McCleary. The exhibition, entitled Voyage, features 15 collages made between 2009 and 2015, and marks McCleary's third solo exhibition with the gallery. 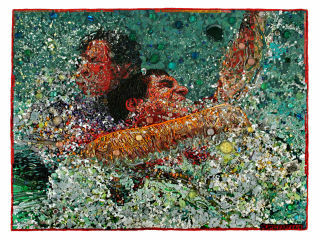 Widely known for these complex, three-dimensional figurative collages, McCleary assembles them with a variety of materials including paint, paper, wood, glass, fabric and beads on heavy paper. These objects are used to construct scenes rich in narrative, bold in color and alluring in texture. McCleary's images are modern-day allegories that refer to history, science, and literature in a contemporary context. McCleary uses materials that are often considered trivial and temporal to express ideas about timeless values. Voyage is on view through Saturday, October 17.